Port – with or without Stilton cheese or a bowl of walnuts – is synonymous with Christmas in the UK. This might not be such good news for the Port shippers, but for many people Port remains a once a year purchase. Here wine-pages tastes and assesses five ready-to-drink Ports that are quite widely available.Tom Cannavan concentrates on aged Tawny Ports – very fine wines that have spent a long time in wood; totally different from cheap Tawny Port, which is often just a blend of young white and ruby wines. 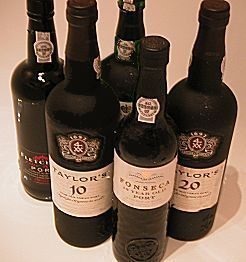 The label age of these Ports – 10-year-old for example – is an average age of the wines in the blend. This is the cheapest Port I know of on the UK market, made for Aldi by the well-established company H & C.J. Feist. It has a medium, ruby colour, and a nose of raisins and cherry, with little chocolaty hints. On the palate it is just a tiny bit spirity, but really at the price this offers a nice soft profile of rich, dark, plum-pudding flavours and a toasty, mellow oak finish. A few pounds more would find lots of competition amongst LBV (Late-Bottled Vintage) styles, but I cannot imagine finding a better value Port. Aldi, £4.49. This slim little two-thirds of a normal bottle is very bijoux and would be a nice gift for a wine lover. Pale ruby/tawny in colour, it has a warm, inviting nose of tobacco, smoke, raisins and rich red fruits, with little hints of fudge sweetness. On the palate this is quite crisp, elegant and fruity, with plenty of fresh, sweet fruit flavours and a nice throat-warming background of honied, warm nuts and spicy oak. Deliciously smooth and easy to drink, this has great length and class. A real step up in quality and very good indeed/excellent. Luvian’s, Roberson, £9.99. Lovely garnet/tawny colour. Spicy, red fruit nose. Nutty element too, with nuances of caramel and clove with aromatic hints of exotic spice. Fruit to the fore on palate, with sweet, rich, chocolate-coated plum and cherry notes, a nice background of acids and tannin, and emerging nut and spice warmth into the long finish. A Port I have always enjoy. Very good indeed. Luvian’s, Majestic, Sainsbury, Unwins, Asda, Safeway, £16.50. Pale tawny, with a hint of garnet. Essence of walnuts, fudge, caramel and Christmassy spices. There is dark damson and plum fruit, and a chocolaty note. Just a hint of spirit, but not obtrusive. Sweet, herb and leaf-tea-edged stewed plum and berry fruit, with prune and compote flavours and plenty of warming, tobacco and spicebox sweetness into a long finish. Very good indeed, but I’d be hard-pushed to say it was worth almost double the 10-year-old. Luvian’s, Sainsbury’s, Selfridges, Tanners, Unwins, £30.00. Pale tawny colour with just a hint of ruby. Enveloping, warm, Christmas cake richness of plums, spices, dark brown sugar, all lifted by little floral hints of old roses and plenty of red fruit. Smooth-textured and soft-edged on the palate, with a luscious sweetness of rich, fruity, mulled wine and spiced punch flavours. A darker, nuttier, chocolaty element and edge of acidity freshens up the finish. Good length, and another elegant, soul-warming, but easy-drinking wine. Very good indeed/excellent. Luvian’s, Fortnum & Mason, Bentalls, £30.00 – £32.00.